Watch me make this treat in the video above. Below is the print recipe. 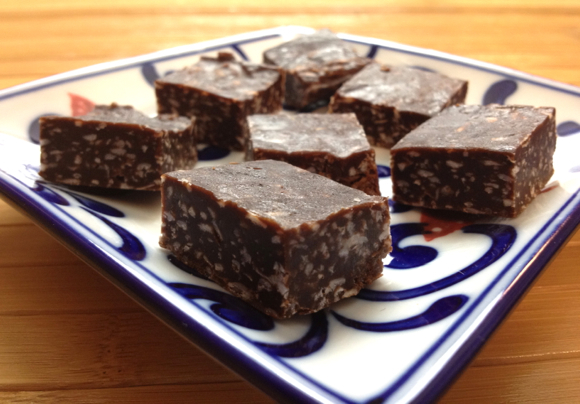 I came up with this candy recipe after trying out these really yummy paleo no-bake cookies from The Unrefined Kitchen. Boiling the honey for two minutes sets it up like candy, and then I kept tweaking the recipe to create these chewy little candies. I know you'll love them. Heat honey in a saucepan over medium heat until it boils. While stirring constantly, boil for two minutes. Remove from heat. Add coconut butter, cocoa powder, and vanilla. Stir. The heat from the honey will melt the coconut butter. Stir until smooth. Add coconut. Stir well. Chill for 30 minutes. Pop out of pan. Peel off parchment paper. Cut into strips and then cut the strips into squares. Put in a refrigerator dish with lid. Store in refrigerator. They are especially yummy served cold, but hold up well at room temperature too (getting a little softer). *Coconut butter is the pureed meat of the coconut. It is not coconut oil. It can be pricey. You could try substituting natural almond butter or peanut butter, though I think the candy will end up softer overall. If you try this, please come back and comment with your results! You can also make your own homemade coconut butter from shredded coconut, however I'd suggest adding coconut oil to make up for the shredded coconut having been defatted. Like my free videos? Please use the buttons at the top of this post to share this video with others. And subscribe to the Traditional Cooking School Channel on YouTube — you can give this or any other video a thumbs-up! What Easter treats are you planning to serve? Please let me how you like these! This post is shared with Simple Lives Thursday and Pennywise Platter Thursday. 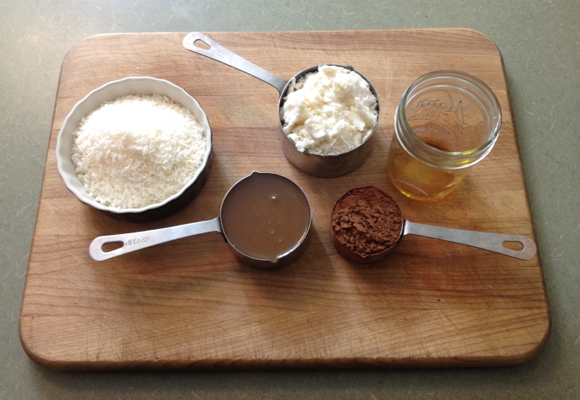 Do you make your own coconut butter? Or can it be purchased? Also, does heating the honey affect its allergy protecting properties? I would like to feed my 4yr old some local honey to help combat the runny nose he is getting due to our high pollen count in our area. Thought this might be an answer. Michele — Honey is best raw. Heating it here is definitely a compromise, but it is what makes the candy “firm”. So, I wouldn’t recommend this for allergy purposes — because raw is best for that. You might want to look into getting local bee pollen and giving him some of that each day. People start out with a grain or two and once they can tolerate that, increasing until they’re taking on the order of teaspoons or tablespoon each day. My son can’t do bee pollen at all. His throat closes up with just one grain. Last year, I worked up to a teaspoon a day. I think it helped me a lot with allergies. Wardee, I just have to confirm your comment about eliminating bread & the allergies disappearing. I discovered, quite by accident, that I am gluten intolerant while doing a 10 day detox that required I eliminate all wheat from my diet. I had many health issues, not the least of which was horrible seasonal allergies. I went GF for a few months, then slipped and stayed on gluten for another two years. I’ve now been GF since mid-December & I feel absolutely amazing. My allergies have hardly given me any issues, though this week has been rough one with everything blooming (I’m in Texas), & all my body aches & pains have disappeared. I’m pretty sure it isn’t true coconut butter because of the lack of fat, but I think it would work. Also, I wonder if you could blend the shredded coconut with some coconut oil to make it more like true coconut butter? Looks AWESOME! I must make this… Thanks Wardee! Looks delicious cant wait to try like these.I will make Coconut-Honey Candy for Easter. Hazel — Thank you for the ideas! There is a very similar recipe from the Kitchen Stewardship website, it calls for coconut oil, and does not have you heat the honey. The candy comes out as a ‘bark’. Very delicious. That is a wonderful recipe and it is great that it is raw. The downside is that it doesn’t hold up at room temperature and it is not as chewy and candy-like as this recipe. Boiling the honey does that, plus using coconut butter instead of oil creates a less greasy-feeling end result. Not that there’s anything wrong with the oil — just the texture is not as candy-like as in this recipe. I would love a bite of this right now! Unfortunately I am out of cocoa and almost out of honey and do not have coconut butter in my pantry. I’ll have to tuck this recipe away for another day when I have all the ingredients. I love fudge, can’t wait to try this “healthier” version. I can’t wait to make this recipe, and all the variations mentioned in the comments. Always a sort of wonderful information and recipe, Wardee. Thanks! Wow this sounds wonderful. I am going to try it as soon as I get more peanut butter (I have been making too many of Katie’s (over at Kitchen Stewardship) peanut butter kisses)! Would it be a possible replacement to use organic butter in place of the coconut butter? Jaye — Hmm…. I don’t think so. Butter is mostly oil, while coconut butter or other nut butters are more “meat” if you know what I mean. I think the end result would be more like coconut bark that would need to be refrigerated to stay solid. Oh darn! Thanks for the reply! This looks so good! Where did you get your cake pan by the way? All I have are glass pans, and the corners aren’t so sharp. Also, would this work with cocoa butter instead of coconut butter? Just curious cause I have that in my pantry. Tanya — These are Norpro square cake pans. You can get them through Amazon.com or Azure Standard, and probably other places, too. I just made these and my 5yo GAPSter is eating one right now while singing “the yummiest thing EVER!” Thanks! I watched the video on how to be done the Coconut-honey candy. I have now the idea on how to make candy’s for Easter day. Perfect ingredients you have. I watch your video while I try how to done coconut-honey candy for my kids. Oh my gosh – wow. Amazing. My cocunut butter was separated and I didn’t warm it to remix it but it actually worked in my favor bc my candy has a white ‘frosting’ top now and it’s delish. How many pieces of this are allowed on GAPS? Seriously. Do you think that this would work with maple syrup instead of honey? I just made them with honey and am trying to wait until they cool to dig in! I would like to make another batch but am running short on honey. Is it necessary to cook the honey? I mean, could it just warm the coconut oil in the dehydrator. Big question since I don’t have a stove and much prefer to eat raw. Thanks. I just made these today – turned out fantastically! Made my own coconut butter with 400g organic desiccated coconut in thermomix speed 8 for 2 minutes, scrape down sides and speed 8 again for another 2 minutes or so. No problems at all coming together. Used 1 cup of this butter for the recipe. Cooked the honey in the thermomix too on 100 and probably let it boil a few minutes longer than the recipe (child helpers!) Didn’t use the extra coconut and it was the consistency of chewy caramels you can buy at the shops. YUM!